Through all the challenges, changes and joy in our lives...Happy Anniversary! Thank you for all your love and support. Happy Anniversary. Hope you both have a wonderful day and evening. Happy Anniversary to both of you! Sixteen years! Wow, that is awesome. Well Happy Happy Anniversary to you and your Hubby! Isn't it grand when you find your true love early enough to enjoy each other!! Enjoy your Special Day!! Happy Anniversary to you both! I wish you many more happy healthy years together!!! Happy Anniversary! What a beautiful bride you were! Wishing you and your dh many more happy and blessed years together! 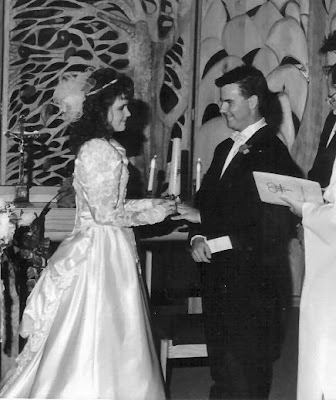 Happy belated Anniversary, Lisa and Jim! What a great picture and a good-looking couple! Still are! How sweet!! What a great couple you make. Happy Anniversary! I love seeing people's wedding pics. You looked beautiful!! happy anniversary. good for you!